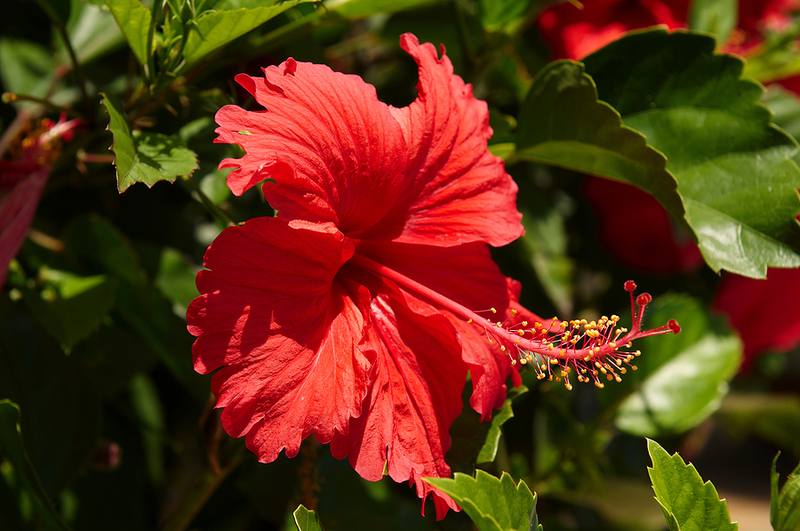 Native to the warm-temperate, subtropical and tropical regions across the world, Hibiscus species have some of the most exotic flowers of all ornamental, flowering shrubs. While the Chinese hibiscus - Hibiscus rosa-sinensis, with its many showy hybrids, is the world's most popular hibiscus, it is not hardy enough for garden use in temperate climates. Which is why the species and cultivars of the hardy hibiscus - Hibiscus syriacus, are the most commonly grown ornamental species in the cooler northern European climates. 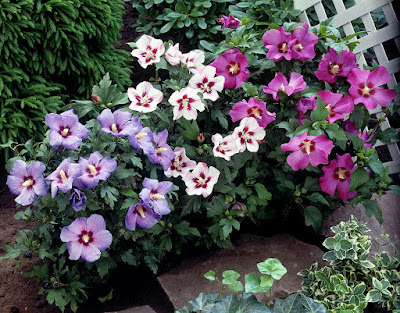 Hibiscus will grow well and any well-drained, fertile soil. However they will perform best in a neutral to slightly alkaline soil. Plant from October to March in a sheltered position in full sun. Hibiscus are late flowering in temperate climates - usually in succession from July to October - and as such it is advisable to provide them a certain amount of protection (such as a south-facing, sheltered wall) in more northerly gardens. To encourage a bushy habit young plants can be pruned hard back in late spring. After pruning apply a generous 5-7 cm mulch of well-rotted farm manure or garden compost around the base of the plant but avoid touching the stem. A humus-rich mulch can them be applied annually each spring. No regular pruning is required, except to remove dead or diseased branches in late winter or early spring. However any long shoots can be shortened after flowering. Note that the flower buds appear on new seasons wood, so while hard pruning will lose the natural shape of the plant it will lead to the production of prolifically flowering side shoots.